Before Shadow of the Colossus PS4 even launched, reviewers had already been finding a number of collectible sparkles they started calling “Gold Coins” but no one was sure what they were, what they did, or even how many were in the game. Slowly, a number of clues started trickling out, such as a line in the credits that referred to Nomad Colossus (a YouTuber known for extensive Shadow of the Colossus videos) and the “79 Steps to Enlightenment.” Once the game came out, more of the community joined the hunt, with many speculating that this mystery would lead to a long-rumored–but never proven–17th colossus. Brian, curator of the PS4Trophies YouTube channel, led the search over the last few days with help from the community and a number of hints from Nomad Colossus. Early this morning he was rewarded when he discovered the mystery behind the Gold Coins. He spent hours and hours tracking down every last one of these mysterious collectibles, and ultimately discovered what collecting them all did. If you don’t want to be spoiled about what finding all of the Gold Coins does, don’t read any further. It turns out the line about “79 steps to enlightenment” in the credits was a hint at how many of the gold coin collectibles were scattered around the world. Collecting the “sparkles” places them on a wall behind the main Shrine of Worship. Collecting all 79 and praying (holding R2) at the now sparkling wall reveals that it is actually a door. I’ve simplified this process immensely. Brian took hours and hours of live streams and hunting to discover these secrets, and I don’t want to pretend that the effort to discover this secret wasn’t a colossal achievement on his part. Entering the door leads to a set of stairs going down (not up, as many in the community had guessed). Deep in the basement, underneath the Shrine of Worship, a jagged stone holds a mysterious sword–the Sword of Dormin. 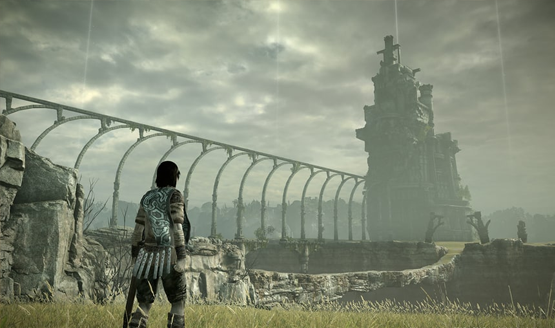 If you’ve completed Shadow of the Colossus, you know the significance of Dormin and what having his sword might portend. The item does massive damage to colossi, but slows health regeneration down. It has a unique look, channeling darkness to direct Wander, instead of light. The eye on the hilt of the sword also changes from white to red when it nears colossi, the same way that the colossi’s eyes do when Wander begins fighting them. You can check out Brian entering that final door and getting the sword in his archived stream below. Many fans are convinced that this isn’t the end of the hunt, and that the Sword of Dormin is just another key in a larger mystery. It’s damage output is the same as the Queen’s Sword, which is unlocked by finishing all 16 colossi on Hard Time Attack, and the Queen’s Sword doesn’t have the health debuff. Anyone that is able to undertake the challenge of finding all 79 steps to enlightenment scattered around the world likely already have the Queen’s Sword, so the Sword of Dormin strikes some as an odd reward for such a big mystery. Already, speculation is underway for what the sword might do. Jump into the comments on the PS4Trophies video and you’ll see many of them thinking this isn’t the end of the mystery. Suggestions have been made about beating the entire game using the Sword of Dormin, and having it change the final scene of the game, showing “enlightenment” in some way or possibly earning redemption for Wander. Rumor of the 17th colossus has begun to swirl again, thinking the Sword of Dormin may somehow unlock a secret confrontation. Or, you know what? It could just be a pretty cool secret cursed sword.